This house has 4 bedrooms & 3 bathrooms. Great for 4 couples as each bed. SORRY, NO SCHOOLIES BOOKINGS ACCEPTED. Sit back, relax and enjoy the views of Port Phillip Bay from the balcony, as you sip champagne and watch the ships go by. On warm Summer days, enjoy the sun drenched balcony with elevated views of surrounding tree tops and the Bay. This wonderful double storey property is nestled among tea trees in a quiet, elevated position, directly inland from the heart of the Rye township (only 800m to the Rye Post Office). Upstairs has a large, open plan area with well equipped kitchen, dining and lounge room. Features include a gas log fire for cosy winter nights and reverse cycle, split system air conditioning. The property has 4 bedrooms and 3 bathrooms. It is situated less than one kilometre from the famous Rye Bay Beach and Rye's Cosmopolitan Shopping Centre with its abundance of cafes and restaurants. Just a few minutes drive to the Peninsula Hot Springs, Moonah Links and The Dunes golf courses. Walking tracks through the nearby National Parks, local markets, wineries and Arthurs Seat Gondola ride and Maze are also a short drive away. What's there and what do I need to bring? You’ll find three bedrooms on the upper level, each with a Queen sized bed ( master has an ensuite). There is also a separate toilet and bathroom with a large corner bath with shower over it. Downstairs, there is a 4th bedroom complete with a Queen sized bed, single bed and a single trundle bed. There is an adjoining bathroom with toilet, shower, washing machine and clothes dryer. The downstairs family room with additional couches and TV, is ideal as a second living area for the children. There is a table tennis table for your use. Off-street, undercover parking for 3 cars under the carport. Salt, pepper, herbs, and a few basic pantry items. Gladwrap, foil and plastic bags. Toilet paper, dishwashing liquid, tea towels hand soap and bathmats are provided. Hairdryers, books, games and DVDs are provided for you to use. WHAT DO I NEED TO BRING? Guests will need to bring their own base sheet, doona cover, pillowcases, bath and beach towels. We do not rent out to schoolies/Rowdies groups. There is a minimum age for renters. A security bond of $1000 is payable 2-3 days prior to stay and will be refunded in full within 48 hours of departure. toilet, shower, Small ensuite for master bedroom. Beautiful views from the balcony of Port Phillip Bay. Watch ships sail past. Close to several Golf courses. Reverse cycle aircon and heater and also a cosy gas log fire. Gas fired log heater, very cosy in winter. tandem carport for 3 cars. Herbs, spices, foil, gladwrap provided for your use whilst staying at the house. Great views of Port Phillip Bay from the sunny balcony. It is a double storey house with no access for wheelchairs. Very comfortable, great location, excellent holiday! This property was very comfortable and the location is great being close to the shops! We enjoyed our stay as the house is equipped with everything you need! Excellent for a couple of families as it has two wonderful lounge areas and 3 toilets!!!!! Owner was very accommodating, friendly and very helpful. We will definitely be staying here again! I'm glad you enjoyed your stay at Bayviews@Rye. 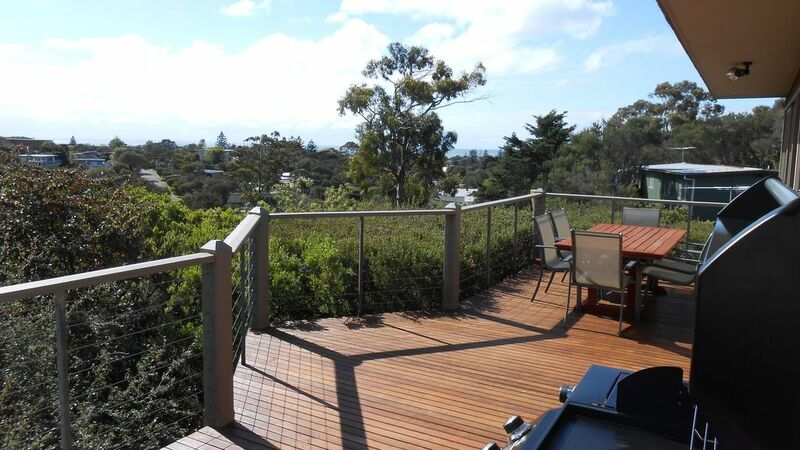 Very happy with Bayviews, property was very clean and bright and the balcony views are wonderful. Communication with the owner was easy and the house provided everything we needed. Would highly recommend Bayviews as the perfect girls week end getaway! Thanks Jodie, So glad you and your group of girlfriends had a lovely time at Bayviews@Rye. Spacious, well presented and stunning views! We thoroughly enjoyed our week stay at Bayviews and found that the house comfortably accommodated our group of 10 young adults. No detail has been missed, right down to the collection of card and board games in the lounge. Linda's communication was prompt and informative. We would happily stay again! For our extended family of 6 adults and five young children. It was clean very comfortable, and a most satisfactory location for beach and other activities. The owner was very friendly, most obliging and we appreciated the champagne and goodies on arrival. Well set out kitchen and living areas. Extremely clean. Bar-B-Q on balcony was great and met all our needs. We found the nearby Peninsula Pantry in Wondaree Street a foodie's delight. For an extended family of 9, including 3 children, there was plenty of room for all of us to either gather together or have some time alone. The great well lit kitchen and balcony was the best part of the house and where we spent most of our time. We made use of the BBQ and shared some great food and stories on the balcony each morning and evening. When the wind picked up we just moved inside. We also had some great walks/runs around the winding streets and enjoyed the NYE fireworks from the deck. Linda had the place spotless and decked out with everything you need for a great stay. The treats and champagne on arrival were a nice surprise. Whilst there was no Wi-Fi, it was a good chance to break away from the IT for the week and to share some good old conversation. I would recommend Bayviews@Rye to other groups/families.